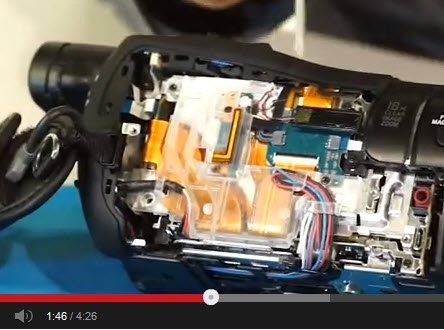 What is inside a HD camcorder? Sony opened up the Sony 4K Camcorder (FDR-AX100/B) to take a peak at how this powerful device comes together to capture the finest details in 4K. Check out the video to see whats inside including the 60 little screws that keep it all together. Capture the finest details in 4K Ultra HD 3840 x 2160 resolution. 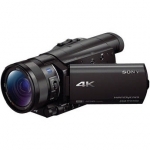 This camcorder allows incredibly high resolution, to produce vibrant and realistic images. 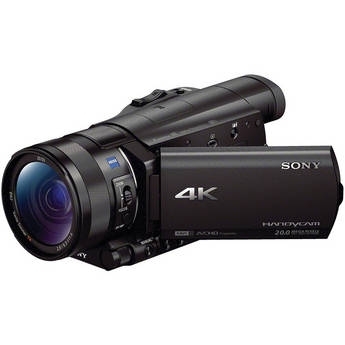 In addition, the fast image processor is the same one employed in professional Sony camcorder models, making it possible to record 60p movies at Full HD resolution for incredibly smooth and sharp playback, with no loss in realism, even when panning the camera and shooting moving subjects. The camcorder features Sony's first 1.0" Exmor R CMOS sensor. The back-illuminated technology improves low-light sensitivity and combines with Sony's Column A/D Conversion to reduce noise by 50%. This is great when shooting in dimly lit environments such as night landscapes or indoor scenes. Capture high-quality 20 MP still images, as well as 14.2 MP (16:9) and 15 MP (4:3) images. You can also take 2.1 MP images while recording video. The FDR-AX100 records Full HD movies in the XAVC S format, which uses MPEG-4 AVC/H.264 codec for compression while saving files in a MP4 wrapper. The highly compressed files allow for longer record times. The camcorder also records in AVCHD, providing high-quality video for HDTV playback and Blu-ray disc burning. Additionally, the camcorder can shoot MP4 HD video, which is ideal for sharing over the internet at up to 28Mbps. Having the ability to switch between all three of three formats makes this camcorder a versatile tool content creation. . For the greatest flexibility, you can even record AVCHD and MP4 formats simultaneously. The FDR-AX100 comes equipped with a Carl Zeiss Vario-Sonnar T* lens. It features a wide 35mm-equivalent focal length of 29mm, making it suitable for capturing landscapes, as well as 12x optical zoom and 24x Clear Image zoom, for getting close to the action. The BIONZ X Image processor enables the camcorder to create more naturally vivid and lifelike images with higher resolutions. Detail reproduction technology optimally filters edges and textures differently depending on the scene. It also features area specific noise reduction which swiftly and efficiently analyzes the subject and reduces noise. The image processor also allows you to record at 120 fps for slow-motion playback at 1/5th the speed when played back at 24 fps after post-processing. Optical SteadyShot Image Stabilization with Intelligent Active Mode is an advanced optical Image stabilization technology that corrects camera shake to capture scenes with smoothness and stability. Intelligent Active Mode analyzes video frames and provides compensation with assistance from the BIONZ X image processing engine. Whether recording movies while walking or zooming, you can capture scenes with a higher level of stability. The FDR-AX100 provides a high contrast 0.39" OLED Tru-Finder EVF which reproduces rich color and deep blacks. The optical design of the EVF utilizes four dual-surface aspherical lenses, allowing for a 33° wide viewing angle that is clear from edge-to-edge of the viewfinder. The 3.5" Xtra Fine LCD screen features a 16:9 aspect ratio and a 921K dot resolution, delivering sharp, bright, and vivid images. The large screen allows you to compose your shots more easily, even when outdoors.